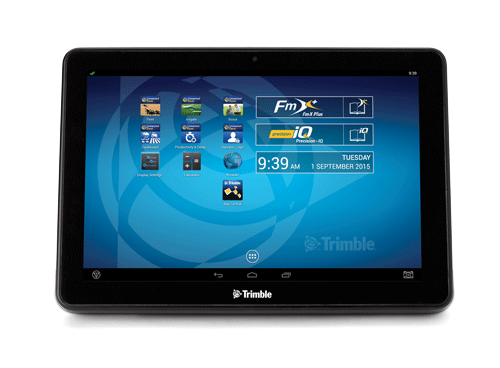 The Trimble TMX-2050™ and MMX-070 display move beyond traditional precision agriculture functionality to provide real farm management decision-making tools in the cab. Built on the Android operating system, the TMX-2050 and MMX-070 display provide advanced GPS-based steering and machine guidance capabilities with an easy-to-use interface that is similar to other smartphones and tablets that farmers already use. With wireless connectivity and mobile applications on the displays, growers have unprecedented control over their field tasks and farm management operations without ever leaving the tractor cab. Through the new Ag Developer Network, customers and developers can collaborate with Trimble to create Android-based applications that address more specialized precision farming challenges. New third-party mobile applications will be available for download from the Ag App Central marketplace on the TMX-2050 and MMX-070 displays. Users can search and find the apps most useful to their farm operations, language and regional compliancy requirements. Pricing and licensing will be handled by each individual app developer. You can review all legal documents by visiting the below pages. All legal documents are available both as downloadable PDFs and a scrollable web pages.